Situated in the mountains, this guesthouse is 0.3 mi (0.5 km) from Leura Mall and within 3 mi (5 km) of Katoomba Scenic World and Three Sisters. Leuralla New South Wales Toy and Railway Museum and Everglades Historic House & Gardens are also within 2 mi (3 km). Leura Station is 6 minutes by foot. Leura is located in New South Wales (NSW) in the picturesque Blue Mountain Region. Leura is a friendly little town made up of cafes, craft shops, art galleries, tea houses and quant boutiques. Leura is situated at the edge of the Blue Mountain National Park and has magnificent views of Mt Solitary. There are a range of outdoor activities like mountain climbing and bush walking through the world heritage listed national park. Our range of Leura hotels will allow you to choose your ideal accommodation and escape, relax and indulge in the beautiful town of Leura. Make your way up to Sublime Point Lookout for stunning vistas of the area, and to snap some photos of the natural environment. If you're intrigued by this attraction and would like to spend a few nights in it's vicinity, look into Valley of the Waters B&B and Mountain Heritage Hotel & Spa Retreat. Bring all your mates on an energetic hike through nature at Leura Cascades. Rest your head at Crimson Villa and Blue Mountains Heritage Motel and you can visit this site everyday. If you find yourself searching for more accommodation options in Leura, look into the Secret Valley Escape and the Federation Gardens & Possums Hideaway. They are located 14 kilometres and 8 kilometres away from the city's main streets. If these two don't meet your needs, try the Storey Grange or the Madison's Mountain Retreat. The close by cities of Kanimbla and Mount Victoria are certainly worth seeing. Kanimbla is 15 kilometres to the northwest of Leura, while Mount Victoria is 15 kilometres to the northwest. 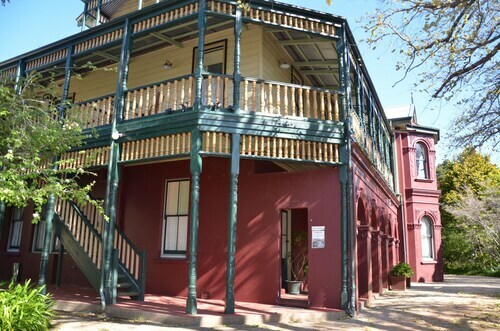 Kanimbla hotels include The Victoria & Albert Guesthouse and Blue Mountains Manor House. The Gardners Inn Hotel and Cedar Lodge Cabins are some of the options in Mount Victoria. If you love sports and want to see games, you might decide to make a trip to Penrith Whitewater Stadium, which is to the east of Leura. The Mercure Penrith and the Western Sydney University Village Penrith are near the action. Travellers planning on flying through Bathurst Airport might like to book a bed at the Best Western Coachman's Inn Motel or the Gold Panner Motor Inn, both of which are a short ride away. How Much is a Hotel Room in Leura? 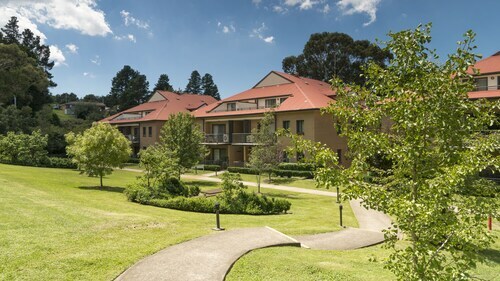 Hotels in Leura start at AU$95 per night. Prices and availability subject to change. Additional terms may apply. Beautiful gardens, great beds, wonderful staff and delicious breakfast!